We’d love your help. Let us know what’s wrong with this preview of Prophecy's Queen by Timothy Bond. In this prequel novella to the epic fantasy series The Triadine Saga, we follow the Elven Princess Rozlynn as she struggles with her role in The Prophecy and what she must do to keep the world from falling into darkness. This is a story of love and conflicts, personal growth, and freedom to choose your own destiny. The world of Elves, Dwarves and humans, is inexorably tied In this prequel novella to the epic fantasy series The Triadine Saga, we follow the Elven Princess Rozlynn as she struggles with her role in The Prophecy and what she must do to keep the world from falling into darkness. This is a story of love and conflicts, personal growth, and freedom to choose your own destiny. The world of Elves, Dwarves and humans, is inexorably tied to magic, wizards and dragons, as the battle of good versus evil, light versus darkness, wages on. Will Rozlynn make the sacrifices and the choices necessary to ensure that The Prophecy stays on the right path? Will her sister, the Elven Queen, prevent her from making her own choice? Will Rozlynn's love for an Elven Hunter betray her and lead her astray? Will fate intervene with Prophecy's Queen? To ask other readers questions about Prophecy's Queen, please sign up. Would this novella make sense if I haven't read *The Triadine Saga*? This story reminded me so much of the epic fantasies I have read and loved so much! The author has built a really interesting and believable world that will learn that the prophecy is not just something for the future to deal with. The characters fit very well into this world. You really feel that you are there with them. The story was easy to follow, but I was glued to the story because I really wasn’t sure just exactly wher I received a free copy of this book and voluntarily chose to review it. For centuries, Princess Rozlynn has studied the prophecies of the elves, dwarves, wizards and others, which existed before the destruction of the first age. The beautiful, brave and courageous Princess knows that the time of prophecy is upon them but she is unable to convince her sister, the Elven Queen or her husband they king. With the help of the sorceress Drianna and the Wizard Rendil Rozlynn undergoes a spell that removes all of her elven features so that she appears to be human. This is do For centuries, Princess Rozlynn has studied the prophecies of the elves, dwarves, wizards and others, which existed before the destruction of the first age. The beautiful, brave and courageous Princess knows that the time of prophecy is upon them but she is unable to convince her sister, the Elven Queen or her husband they king. With the help of the sorceress Drianna and the Wizard Rendil Rozlynn undergoes a spell that removes all of her elven features so that she appears to be human. This is done so that she can become the future Queen of King Leondis and give birth to the Children of Prophecy. There is a spell created by Drianna, that once spoken will bind the King to Rozlynn and ensure that prophecy and/or fate is played out as it should. After she is introduced to the king at a ball where all the best young ladies are attending hoping to become the queen, Rozlynn who has to pretend to be a minor noble from an obscure region of the country decides not to invoke the spell at once. While she is committed to the part she must play. She does not want to be just a “broodmare” for a king whose past escapades are filled with women that he has taken to his bed; she will not become a queen who overlooks their husband infidelities. While Leondis will never know all that she has sacrifice, she cannot forget that she has left everything and everyone she loves so that the world might have a chance to survive and as they get to know one another she finds herself falling in love with the king which she did not expect. She wants him to love her for herself, not because of a spell which is causing Drianna to become very worried. At first she is worried that Lady Rozlynn is playing to hard to get and then once everything goes as it should she becomes upset when Rozlynn does not immediately invoke the spell after they are wed. This prequel ends as Rozlynn releases the spell and Drianna is leaving the city as she promised she would. The reader only knows that the children were born if they have looked at for others in the series. This is a series I am looking forward to reading, but although I have already purchased the box set that includes this prequel and the first two books I am going to wait for the third book to released later this summer. I hate having to wait months or years to continue a story that I really enjoy. While I am not sure how many books the author has planned for this series I am hoping that if it’s not a trilogy that it’s a tetralogy and the final book will be available in early 2016 so that his reader will know the outcome of a series that has become my favorite this year. Since I have not read the other books yet, I cannot comment on the age level for the entire series but this prequel can b enjoyed by all readers 14 and up and although there is not a lot of violence in this book I do feel that anyone who is planning on reading this series reads this prequel novel. I also hope that the books have maps; this is a series that needs them. We need maps of what the world looked like before the war that nearly destroyed it and how it appears currently before the Dark Wizard tries to complete the task that he began then. Prophecy's Queen by Timothy Bond is an excellent example of how a fantasy book should be written. It is full of action and intrigue and leaves little time for readers to catch their breath. The author did a great job of developing a tale which grabbed my interest from page one. It was full of plot twist and turns, which kept the story flowing and building. There was lots of intrigue and thrills to keep me on the edge of my seat as I read. I really liked the author's style of weaving a tale of fan Prophecy's Queen by Timothy Bond is an excellent example of how a fantasy book should be written. It is full of action and intrigue and leaves little time for readers to catch their breath. The author did a great job of developing a tale which grabbed my interest from page one. It was full of plot twist and turns, which kept the story flowing and building. There was lots of intrigue and thrills to keep me on the edge of my seat as I read. I really liked the author's style of weaving a tale of fantasy. Timothy Bond did an excellent job of developing a cast of characters that were easy to believe in and follow. By providing just the right amount of background information on each character, they came alive and were very real. Couple this with a well written tale and I was absorbed into the story and loved it. 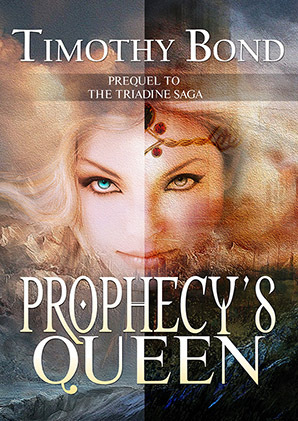 I really liked Prophecy's Queen by Timothy Bond and I highly recommend this book to all readers. I have read this book twice now. I read it before I read the other books in the saga and I read it again after finishing the second book of the saga. This story line is riveting. I can't wait for .the next book. Epic fantasy written in traditional style. Will warm the heart of any fantasy buffs who enjoy older texts such at Mort de Arthur as much as newer works. Lots of lovely nods to classic literature style. Wonderful beginning to a magical fantasy series. It is the time for The Prophecy to be fulfilled by an elven princess, who has prepared for centuries for this moment. Time to set the propherecy in motion for the fight against an evil wizard from an earlier age. Looking forward to the rest of this series. A wonderfully written, easy to follow read with twists and turns that captivates your attention from the beginning till the end. I read straight through and couldn't put it down. Its definitely a page turner with surprises and unpredictable. I totally enjoyed this read and think Timothy did an exceptional job in bringing this read to life. When I first start reading it, I thought I was not going to like the book. As I read each chapter it drew me in more and more. Once I got about two chapters in I could not put the book down. I really enjoyed this book. I loved the characters. Of course my favorite was Rozlynn. I liked how she was playing hard to get. I am excited to read book 2 to see what happens next. Good read is all I’m going to say. First time reading anything by Timothy Bond and I must say he’s good at his creating his stories. I will most definitely be checking out more of his work in the future. What an enjoyable story! Fine,fine plot and characters....Left me wanting more,though (it was that good) This has to be part of a larger epic,though and I intend to seek those books out...RECOMMENDED READ!! After listening to the whole prequel, I think this might be one for readers to read after the first book. The way it ends left me wondering what would come to pass for Rozlynn and if the prophecy was true or not. Thankfully, the author also adds the first three chapters of the first book, which gives you the answers. But I also think that reading the first book then going back to this moment would help fill in gaps a first time reader, starting here, will feel are present. After hearing the first After listening to the whole prequel, I think this might be one for readers to read after the first book. The way it ends left me wondering what would come to pass for Rozlynn and if the prophecy was true or not. Thankfully, the author also adds the first three chapters of the first book, which gives you the answers. But I also think that reading the first book then going back to this moment would help fill in gaps a first time reader, starting here, will feel are present. After hearing the first three chapters of the first book, I'd be curious to hear where it goes. Prequels are hard to judge a series on as we don't get all the information but a piece of it. Rozlynn is determined to help the prophecy stay on the right path, taking her place in the way things go. She'll do what it takes to keep the Elves kept secret but to bring the ones that will save the world from the Dark Wizard. Yet, Rozlynn must face the losses she'll feel along with the King she needs to grow close too. This is my first experience with the narrator Jilletta. I liked the sound of her voice as she voiced the many characters present. She did small extras to help the story pop in vocals such as; someone talking through a door with you on the inside, a dragon's voice is deeper (whether hers or digitally enhanced, I don't know but liked), and different tones for each character. However, at the beginning I struggled with the vocal editing. It sounded like the voice quality kept changing. Like the narrator did voices for different characters separate then spliced them in where needed to be. I felt the quiet space around her is different, along with the echo around her voice. There felt like there was a break and addition in the pauses. It's hard to explain, but I felt it in the beginning. I don't know if it was the equipment or the room she was in. There was also a strange skip in the narration of three to four words, like they were clipped in. Some may not even pick up on the background silence, or even bother them, but it was distracting for me. It cleared up before I was half way (maybe a third) through the four hours and continued on through the end with the clearer feel I could enjoy. There weren't any chapter number notations either. Rozlynn, our main character, is a smart and strong woman in the way she does what she's to do. She has strong reasons for her actions, though I can see others seeing her as she may think too highly of herself. But to capture the heart of a man who finds it easy to bed any woman, you have to stand your ground and make a show of how she won't be taken advantage of. She goes about this with a well rounded thinking, I liked this as it wasn't as cut and dry as others would like to think. This story is of Rozlynn as she does as she feels is right to bring the prophecy to pass, for the good and not evil path. This book isn't all fight and glory. It's about a woman facing what she leaves behind and what new is before her. She helps make a life she can live with in doing so. I found that suddenly I was caught up with who was who and what was the agenda of everyone present, listening intently to learn what happens to Rozlynn and about the prophecy. But in the beginning of the story I felt like I was missing information, things that would have made it a bit easier for me to place where I was and what the characters were striving for. I was confused on two characters names for a short time as well. There are shades of Eddings in Prophecy's Queen - a prophecy of two paths, one good and one evil, and a promised child (or two, in this ca I picked this up for free on Amazon, attracted by the fact that 1) it was epic fantasy and 2) the author is currently residing in my hometown! As this is a novella, it is fairly short in length. At a 162 pages, according to Amazon, it’s an easy afternoon read. However, it gives great insight into the rest of the saga. Rozlynn might be a princess, but she knows that she plays an important role in The Prophecy. Unfortunately, her sister, Queen Lilliene, disagrees with her. The queen doesn’t believe that the time of The Prophecy is upon them and thinks that Rozlynn is being rash and is sick and tired of Rozlynn always going on about The Pr As this is a novella, it is fairly short in length. At a 162 pages, according to Amazon, it’s an easy afternoon read. However, it gives great insight into the rest of the saga. Rozlynn might be a princess, but she knows that she plays an important role in The Prophecy. Unfortunately, her sister, Queen Lilliene, disagrees with her. The queen doesn’t believe that the time of The Prophecy is upon them and thinks that Rozlynn is being rash and is sick and tired of Rozlynn always going on about The Prophecy. So, in the end, Rozlynn decides to no longer bother the queen with her observations and does what she must. This prequel was written after the first two books of The Triadine Saga. However, the author claims this book can stand alone. Once you realize that it’s the prequel to a much greater story, you’re more than interested to look at the following book, The Watcher’s Keep. Well-written and rich in imagery, it’s an interesting story that keeps your attention from beginning to end as the intrigue is played out. This prophecy affects everyone, elves, dwarves, and humans alike. As such, this small novella has a large cast of characters. While we are introduced to some more than others, you’re still given a great idea as to what will follow and make you excited to continue reading the saga. There were a few areas that were edited a little differently than I’m used to. That’s not a bad thing, but it did mess with me a little bit. There also were areas where a lot of information is given out here and there. One dealt with Rozlynn’s appearance and that’s the one that bothered me the most. The others seemed to fit into place a little bit more. I do realize this was a novella, so a lot of information needed to be handed out in a small amount of space, but I personally believe it could have been worked in a bit better. Other than that small bit, this book was a great read. I enjoyed reading Prophecy's Queen, the prequel novella to the Tridine Saga, and I'm now looking forward to the first book in the series, the Watcher's keep. Hopefully, I'll be better grounded as the series progresses. This prequel involves Princess Rozlynn,an Elf, who's studied the prophecies of the elves, dwarves, wizards and others, which existed before the destruction of the first age. Princess Rozlynn knows that the time of prophecy is upon them but she is unable to convince her sister, the I enjoyed reading Prophecy's Queen, the prequel novella to the Tridine Saga, and I'm now looking forward to the first book in the series, the Watcher's keep. Hopefully, I'll be better grounded as the series progresses. This prequel involves Princess Rozlynn,an Elf, who's studied the prophecies of the elves, dwarves, wizards and others, which existed before the destruction of the first age. Princess Rozlynn knows that the time of prophecy is upon them but she is unable to convince her sister, the Elven Queen or her husband they king. With the help of the sorceress Drianna and the Wizard Rendil Rozlynn undergoes a spell that softens her elven features so that she appears to be human. This is done so that she can become the future Queen of King Leondis and give birth to the Children of Prophecy. There is a spell created by Drianna,a Wicca Sorceress that once spoken will bind the King to Rozlynn and ensure that prophecy and/or fate is played out as it should.But Rozlynn will not immediately release the spell to Drianna's concern. After being introduced to the King, he instantly wants this unknown nobles daughter but she will not become a queen who overlooks their husband infidelities. While Leondis will never know all that she has sacrifice, she cannot forget that she has left everything and everyone she loves so that the world might have a chance to survive and as they get to know one another she finds herself falling in love with the king which she did not expect. This prequel ends as Rozlynn releases the spell and Drianna leaves the city as she promised Rozlynn she would do. I found this book enjoyable, easy to read/follow and the characters were realistic, believable. The storyline seemed to waver at times, though - sometimes it lagged, while other times it picked up pace. I found the formality of the writing style took a little getting used to, however once I did, it was no longer an issue. I wish the story had gone more in to the growing relationship between Leondis and Rozlynn. After all, she had been there a little under a year, and yet the reader is only given I found this book enjoyable, easy to read/follow and the characters were realistic, believable. The storyline seemed to waver at times, though - sometimes it lagged, while other times it picked up pace. I found the formality of the writing style took a little getting used to, however once I did, it was no longer an issue. I wish the story had gone more in to the growing relationship between Leondis and Rozlynn. After all, she had been there a little under a year, and yet the reader is only given little glimpses here and there in regards to their courtship. It also would have been nice to have some background about Drianna - in regards to her connection to the primary characters - and especially about why she takes certain actions or makes certain decisions. You know she says "no I won't do this" however the reason isn't clear. You know her background in regards to who/what she is, however not much more than that is given. As a "quick prequel", the book is decent, quick reading... however I feel like the bridge between the end of this book and start of next book (the first chapter is given as a "teaser" at the end of the book) leaves a lot of questions unanswered. The jump is too vast. I only hope that the reader doesn't have to wait *too* long for some of those answers. I like epic fantasy more similar to Game of Thrones than to Lord of the Rings, however, this kept my attention and had me interested as to where the story would lead. I had seen the trilogy advertised, yet did not want to invest in books of 200,000+ pages only to find the story or writing not to my liking. Getting this book for free did indeed plant the seeds of curiosity for the full novels. As I said, I'm not normally interested in Goblins and elves, however, I think this novella is a great se I like epic fantasy more similar to Game of Thrones than to Lord of the Rings, however, this kept my attention and had me interested as to where the story would lead. I had seen the trilogy advertised, yet did not want to invest in books of 200,000+ pages only to find the story or writing not to my liking. Getting this book for free did indeed plant the seeds of curiosity for the full novels. As I said, I'm not normally interested in Goblins and elves, however, I think this novella is a great set up for future adventures. The writing style is impeccable, it is beautifully edited, and I must say ... although some of the critical reviews state it bounced around or was repetitious, I found none of that. I'm not exactly sure how the author could improve on it, as it did what was expected--- provided the background information for the future. I think it is unfair that one reviewer stated the subplot went nowhere-- isn't that what the trilogy will be for? The action packed epic full story? I understand this story relies heavily on prophecy, hence the title of the story, however, it became so redundant hearing about it that it was detracting from my enjoyment. The story itself was well done for a short novella about how the main characters were to meet and come together to see the prophecy along the proper path. The characters were likable enough and the reader could connect with them. Basically it was just a drama story to provide a background for the trilogy and flesh out some characters. There is no real threat or danger to the characters. If this were all I had to read to sell me on purchasing the first book in the trilogy, I would be hard pressed to do so. The inclusion of the first chapter of the first book I the trilogy was more a deciding factor and now I'm intrigued to add The Triadine Saga on my to read list. This review is based on the Beta edition so no guarantee that issues found there will still be in the released version. This book is supposed to jump start the Triadine Saga by showing a little bit of back story on how the king and queen met to produce kids that will be in the main trilogy. Although the purpose of the novella was served, it was difficult to get past a lot of the OMFG You gotta be kidding me moments created by the style of writing. The novella also suffered from scope explosion d This review is based on the Beta edition so no guarantee that issues found there will still be in the released version. This book is supposed to jump start the Triadine Saga by showing a little bit of back story on how the king and queen met to produce kids that will be in the main trilogy. Although the purpose of the novella was served, it was difficult to get past a lot of the OMFG You gotta be kidding me moments created by the style of writing. The novella also suffered from scope explosion due to a lot of character introductions that didn't propel the story to where it needed to go. I would rather have seen more focus & development on the two main characters and a lot less on characters that mean nothing after a generation when the trilogy starts. If that's the sequel, I'm ready right now to read more! I'm not usually into fantasy stories, but I have to admit: I did like this one. First of all, let's face the truth here: we all love Dwarves and Elves &Co.
And I personally do love prequels: for me are always the best part of anything, either when it comes to movie or books. I lose myself into the idea that everything's about to happen, and you get to understand how and why. And here is an engaging book,an easy read that will make your day. If that's the sequel, I'm ready right now to read more! And here is an engaging book,an easy read that will make your day. It took me just a couple of hours, but it's worth it. And now that the prophecy has come to life, I'm curious to see what the Lord-God, the Dark-Wizard will do. Prophecy's Queen is an intriguing story. It is the story of an Elven princess who is trying to make a human king fall in love with her in order to fulfill an ancient prophecy the says the world will end if half breed children are not born to save it. While the princess has a spell that will make the king immediately fall in love with her, she wants him to fall in love with her without magic. I enjoyed this book so much. I was drawn into the story from the very first page and could not wait to see what would happen on the next page. Rozlynn made some sacrifices and some tough choices but to find out more you will have to read the book. She had to deal with some conflict, and try to choose her own destiny. I was wondering just what she would do. This author has several other books- "The Watcher's Keep" and "The Dragon Rises" and I can not wait to read these books. The first one was li I enjoyed this book so much. I was drawn into the story from the very first page and could not wait to see what would happen on the next page. Rozlynn made some sacrifices and some tough choices but to find out more you will have to read the book. She had to deal with some conflict, and try to choose her own destiny. I was wondering just what she would do. You know a book is good when you finish reading, and you keep looking back at it like there must be more story in there somewhere! I will be downloading the next one ASAP. I can't believe I didn't know about this author. The world building is phenomenal, and I cannot wait to see what happens next with these fantastic characters. If you are a fan of David Eddings then you will love this series! This is a good book. I wish I'd read the other books first before this prequel. After reading it first I'm not sure if I'll read the other books. The characters are interesting and it's a good story. I did enjoy reading it, though parts were slow and needed more action. I'm hoping the other books will have more action and I'm curious to find out if parts of the prophecy came to fruition. I have received this as a first read. This is a prequel to the Triadine Saga. I have not read any of the saga. However I could followed the story here and really enjoyed this story. it keeps you interested from the first page. Definitely has some twists and turns a fun read. I will definitely look into more of this saga. Wonderful introduction to this rather intriguing land. Vivid characters and the world building is excellent. The writing quality is impressive. Will definitely be following this series, it looks like a great one! Multiple story fibers developed through the story to form a well crafted yarn of fantasy. It painted an excellent picture for anyone looking to be caught up in its characters and conflict. Better than expected. I felt it started a little too simplistic, but then I did engage with the characters and plot, and things started to move along. It's a quick read, as well, and I am interested enough to follow through on the trilogy now. Closer to 3.5 stars. Once again, enjoyable, I liked it. More of a little detour as we get a more detailed background tour of some stuff we knew. If you like the series you should read it. Such a great read! I can't wait to get the next book! Just got to wait till payday! Lol. Can't come fast enough!